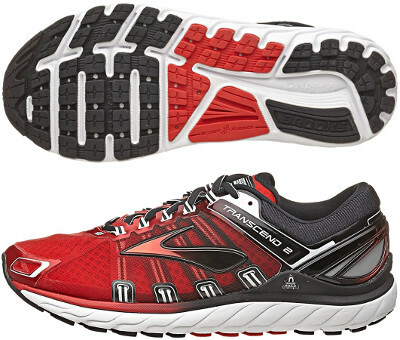 Brooks Transcend 2 are stability cushioned running shoes. The Brooks Transcend 2 is the premium stability model from the american brand for those runners looking for overpronation support, great cushioning and luxurious materials. The Transcend was released only 6 months ago and it was almost a complete new shoe from Trance 12, so expect not many changes in this update. This version features a redesigned upper with moisture management mesh to provide superior comfort even under hard conditions. Lateral straps are integrated within lacing system and they are extended until midsole for a snug fit. Synthetic overlays are strategically located for improved breathability. As well as its predecessor the Transcend, this version features a very stable ride through guide rails on both sides of the shoe, allowing the complete body to align and run more natural. Midsole material "Super DNA" adapts to each stride taken while ensuring plush comfort and shock absorption. Outsole disperses pressure (through Ideal Pressure Zones) evenly in the heel for smoother ride.